Ironstone Vineyards is creating its legacy through more than just great wines. When John and Gail Kautz founded Ironstone Vineyards , they wanted to create a magnificent winery that would serve as a legacy for their children's children. 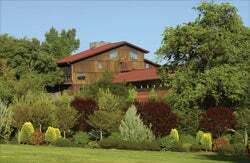 They chose a location rich in legend, history, and winemaking: the Sierra Foothills. At 2,400 feet, this area is blessed with warm summer days and cool mountain nights, producing full-bodied reds and distinctive white wines. Even before the Gold Rush of 1849 brought prospectors to the area, grapes grew in the fields of pioneering vintners. Building the winery in its 70-acre vineyard just outside of Murphys in Calaveras County required hiring a specialized crew to hand-blast through 10,000 square feet of aging caverns of solid rock. The crew complained that the rock was "as hard as iron" and the name Ironstone was born. It's been nearly 20 years since the seven-story winery was built. The splendid architecture replicates a mid-1800s gold stamp mill and is a center for culinary events, outdoor summer concerts, and conferences. There is even a historical mining museum. But the Ironstone legacy goes beyond its glorious facility and a fleet of fine wines. 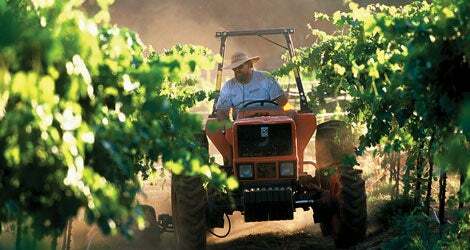 Ironstone Vineyards is committed to practicing sustainable viticultural winegrowing to help reduce water use, build healthy soil, and maintain the surrounding wildlife habitat. Depending on the growing season, Ironstone uses: leaf-pulling or leaf removal to reduce the likelihood of bunch rot; cover crops to improve soil quality and improve water penetration; owl boxes and raptor perches to help reduce rodents who damage vines; and drip irrigation systems. Ironstone also looks beyond its crops to the creeks, streams, rivers, and wetlands--in and beyond their vineyards-to support their vitality. Through bank stabilization, the removal of non-native invasive plants, and the restoration of native vegetation and trees, many of these habitats are flourishing, giving wildlife a safe haven in which to live. The legacy John and Gail Kautz envisioned is certainly intact. And it extends beyond their grandchildren, to their community, and the wildlife that thrives in the pristine Sierra Foothills. Take Hwy 49 to Hwy 4 to Murphys. Turn left on Big Trees Rd. Go straight past two stop signs and continue straight. The road becomes Six Mile Rd. Winery is one mile on right.